Stippled ceilings were used a lot in the late 1970s and 1980s. Their advantages were that the stippling easily covered defects such as stains and cracks in the original ceiling, and they damped sound. 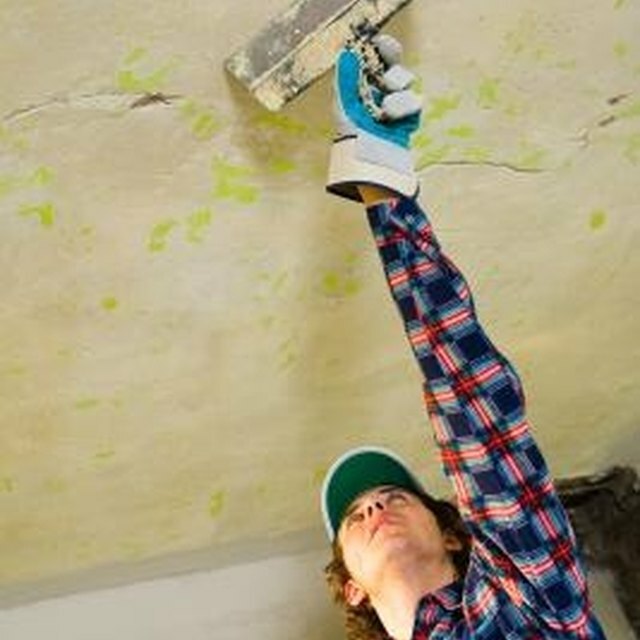 As distinguished from popcorn ceilings, which are applied by spraying a compound on the ceiling, stipple ceilings are installed by dipping an applicator tool into drywall mud, applying the mud to the ceiling and texturing it with a stipple brush. The result is a surface that has little stalactites of plaster protruding downward from the ceiling. The only way to remove a stippled ceiling is to sand it off. Stippled and popcorn ceilings were popular in the 1970s and 1980s. Remove as much furniture as you can from the room and cover the rest, as well as the floors, with drop cloths. In one corner of the room, set up a stepladder that allows you to reach the ceiling comfortably. Fit a light-duty electric orbital sander with 60-grit sandpaper and begin sanding down the stipple, moving the ladder a couple feet at a time, sanding across the ceiling until you have "knocked down" all of the stipple. You will need to move the furniture as you go if any is left in the room in order to reach the ceiling comfortably and safely. If you are satisfied with the more subtle pattern now on the ceiling, you can stop here. Continue sanding using a pole sander fitted with 120-grit sandpaper, then again using 200-grit sandpaper until the ceiling is smooth, if you want a completely smooth ceiling. A pole sander is a hand tool that looks like a floor mop with a long handle. In place of the mop head is a plate to which you attach sand paper. You use the pole sander from the floor, not a ladder. A hand sander is better than an electric sander after you get the first rough layer of stipple off because it would be easy to damage the drywall paper under the stipple with an electric sander. Take up the drop cloths. Clean the ceiling, walls, fixtures, furniture and floor with a vacuum cleaner. Another option is to cover the stippled ceiling with a new layer of drywall. Some drywall compounds sold in the late 1970s contained asbestos. If you have any reason to think your stipple ceiling contains asbestos, do not sand it until you have it checked. Sanding a ceiling with asbestos in it would release airborne asbestos, which is associated with certain cancers. Home Focus: How Do I Remove Ceiling Stipple to Prepare to Paint?